Volga Dream cruise line was founded in 2004, The company purchased a former Soviet vessel, Komarno, and through two years of extensive structural work and a refurbishment that redesigned her interior, re-launched it in 2007 as Volga Dream. The ship carries 100 passengers, fewer than most of the other river ships that cruise in Russia. 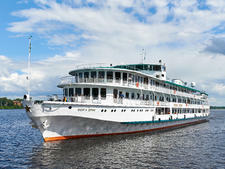 Volga Dream cruises along Russia's Volga River between St. Petersburg and Moscow, and Moscow and Volgograd. All Volga Dream cruises include central, 5-star hotel accommodation in both St. Petersburg and Moscow, allowing passengers to get the most out of their time exploring the historic landmarks and other attractions. Volga Dream is the only vessel operated by the family-owned company of the same name, which was founded in 2004 to provide boutique-style Russian river cruising. Since 2004, the Volga Dream cruise line has aimed at the higher-end of Russian river cruising. Volga Dream is smaller than most ships, and offers amenities and comfort that meet the standards you might expect on European river cruise lines. The onboard experience includes low passenger-to-crew ratios, personalized service and every cabin has an outside window (some with private terraces) and a flat-screen TV. There’s also a fitness center and sauna. The chef prepares menus that showcase Russian and European cuisines, including vegetarian options, all served by English speaking staff in a smart-casual atmosphere. Breakfast and lunch are buffet offerings, and there’s always a set-menu choice at lunchtime. Dinner aboard is a grander occasion comprising four to five-courses that often feature fare from different parts of the world. Meals are accompanied by complimentary wine, beer and soft drinks. One dining highlight is the Russian-themed dinner when servers wear authentic traditional costume. Entertainment aboard tVolga Dream has a distinctive Russian flavor and focus, with activities geared to introducing passengers to all things Russian. There are plenty of opportunities to discover traditional Russian culture such as nesting doll painting workshops and introductory Russian language sessions, as well as cooking demonstrations and talks on Russia’s rich and varied history, education and politics. Passengers can immerse themselves in music by famous Russian composers like Rachmaninov and Tchaikovsky with classical recitals performed by a resident concert pianist. For a truly authentic taste of Russia, passengers are invited to take part in the bread and salt ceremony, a costumed Russian tea ceremony and, inevitably, vodka tasting (which is far more varied and delicate than you might think). Many passengers who sail with the Volga Dream are experienced cruisers, usually, but not exclusively, aged 50 and over, coming from the U.S., Canada, Australia, the U.K., Germany and France (for German and French-speaking groups, there is always a dedicated interpreter aboard). The line is geared to English-speaking travelers, but does try to help passengers learn a little Russian as they sail either of two routes along the iconic Volga; between Russia's two most famous cities, Moscow and St. Petersburg, and from Moscow to Volgograd. With one ship, Volga Dream’s focus is on providing high-end river cruises. The vessel is purpose-built for river operations and can navigate the shallower waters and canals encountered along Russia's extensive waterways. Volga Dream was launched in 2007, after an extensive, two-year refurbishment. Every cabin is outward facing with a window and has climate-control and en-suite bathroom, flat screen TV and minibar. The Owner‘s Suite aboard Volga Dream also has a private veranda. The vessel accommodates just 100 passengers which makes for a relaxed and intimate atmosphere. There’s a restaurant aboard along with a piano lounge, two bars, a library, 24h coffee station, gym, sauna and sundeck solarium.